Cauliflower Mac And Cheese - Less Than 200 Calories! 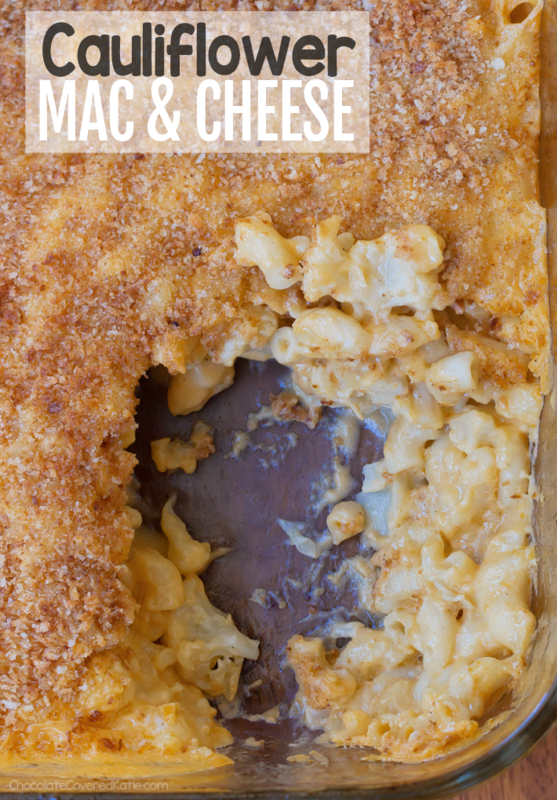 An ultra creamy and cheesy cauliflower mac and cheese recipe, perfect for feeding a crowd! 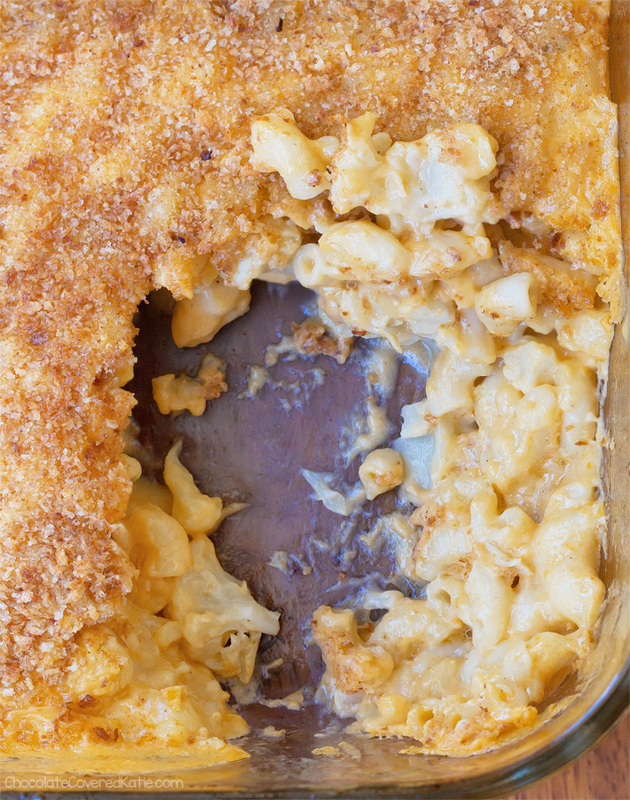 This super healthy baked cauliflower mac & cheese is the ultimate lightened-up comfort food – with just 7 ingredients! 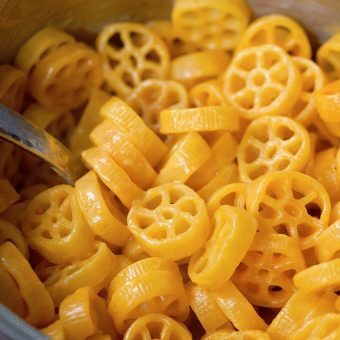 Even people who normally go for regular mac and cheese and have no interest in healthy eating whatsoever give it their passionate stamp of approval. 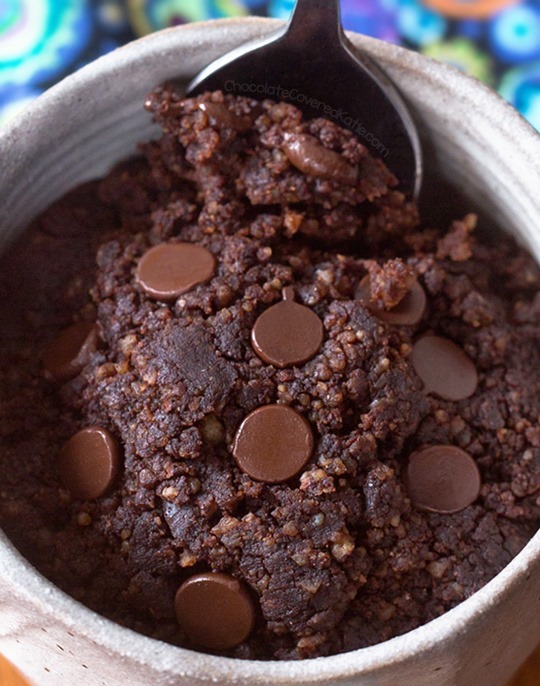 The recipe is a huge crowd pleaser! The idea for this homemade cauliflower mac and cheese came from a party I attended about a year ago. 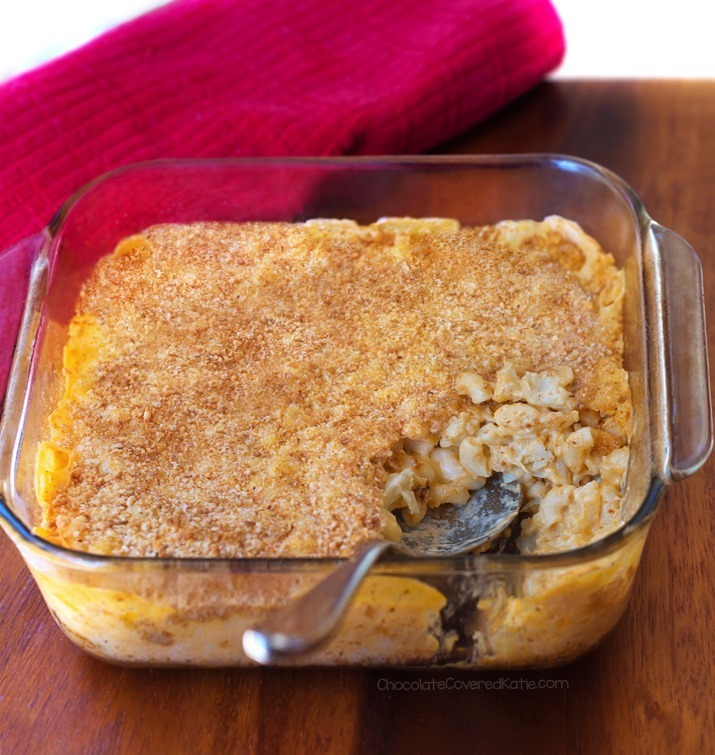 One of the guests had brought a traditional macaroni and cheese casserole dish made with cauliflower, and people at the party could not stop raving about it or asking for the recipe. So I asked for the recipe too, with the hope of recreating my own vegan and healthy version. It took a few tries, and when I finally got it right, it was time to put the recipe to the ultimate test: serving the cauliflower mac & cheese to others, without mentioning that it was low fat and healthier… and watching to see the reception. I did what I often do with recipes, which is to make it for a large gathering of people and quietly set the dish down, not telling anyone it was mine, to ensure their unbiased reactions. I was so excited when—just like they had with my friend’s traditional mac & cheese—people went completely crazy for the lower-calorie cauliflower version! 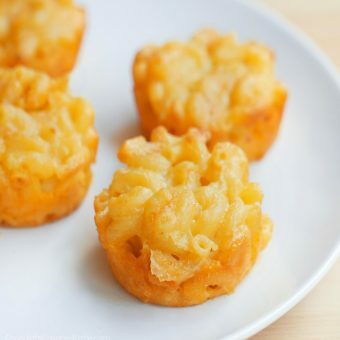 I haven’t tried it, but for a keto and low carb cauliflower mac and cheese with no pasta you might try simply replacing the macaroni noodles with additional cauliflower and using almond meal instead of the flour. Be sure to report back if you try it that way! Use your favorite vegan cheese for a totally vegan cauliflower mac and cheese, and the recipe can also be gluten free if you use gf pasta and flour. The casserole is Weight Watchers friendly and makes about six servings as written. Or it can easily be doubled to fit a 9×13 pan and feed a larger crowd. 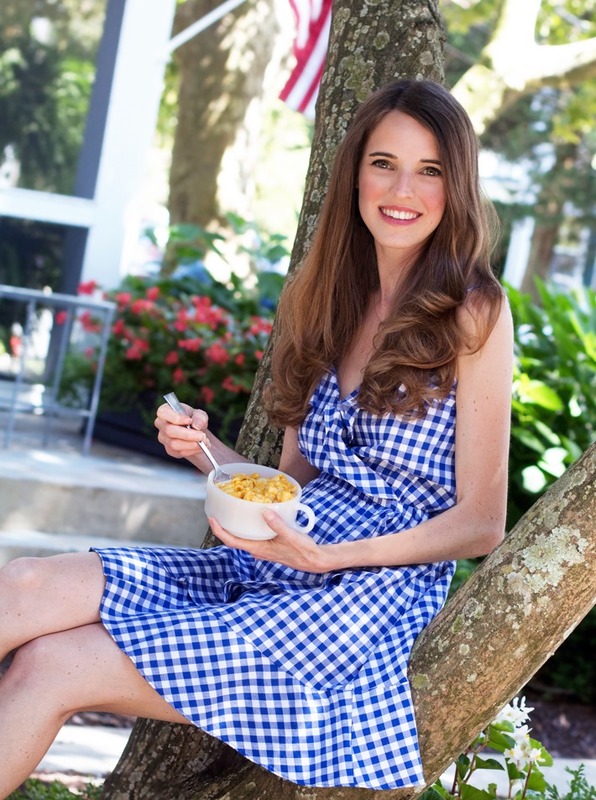 The concept of cauliflower macaroni and cheese actually dates back to at least 2011, when Kraft debuted their box of Kraft Macaroni & Cheese Cauliflower. 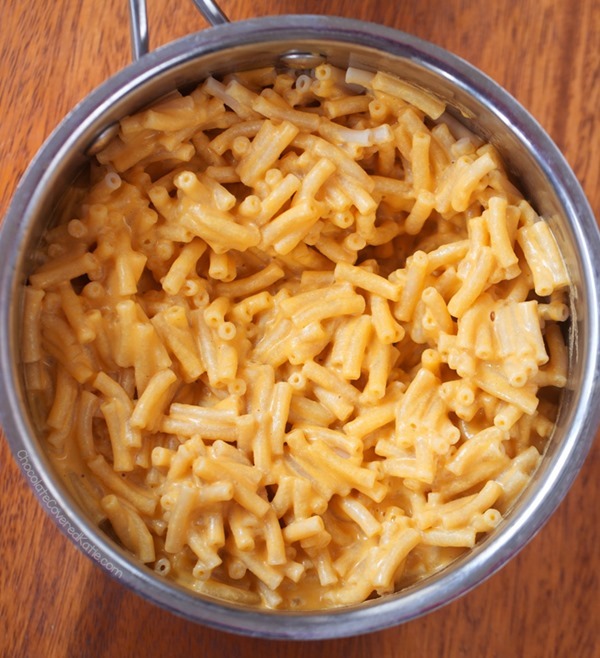 I’ve never tried the Kraft version, but homemade is always better anyway, not to mention healthier! 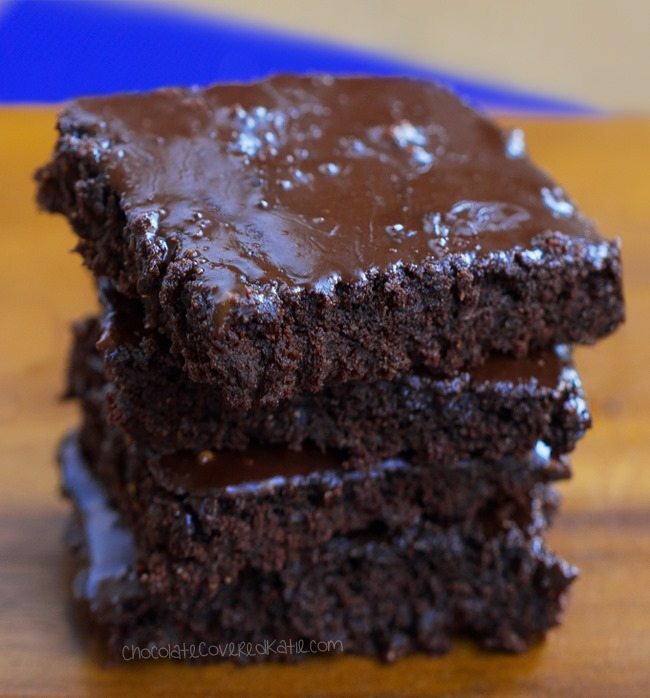 If you try this recipe, be sure to rate it or leave a comment below… Or tag @ChocolateCoveredKatie on Instagram so I can see and like your pictures! Boil the water in a large pot. Add cauliflower and macaroni; cook over medium heat, stirring occasionally, 7 minutes or until macaroni is al dente. Drain; return to saucepan, and cover to keep warm. Meanwhile, heat oven to 350°F. Grease an 8×8 pan. 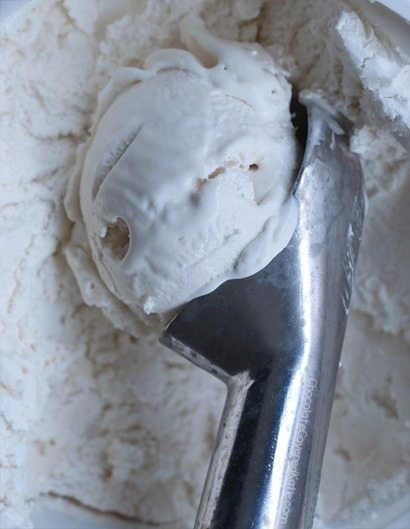 In a medium pot, stir milk, flour, optional butter spread, and salt with a whisk until smooth. Cook over medium heat, stirring constantly, until mixture boils and thickens. Remove from heat. Stir in cheese until melted. 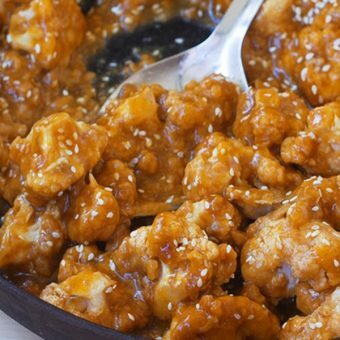 Combine sauce and pasta mixture, stirring and breaking up any large cauliflower pieces. Taste, and season as desired. I like to add a little extra salt and a pinch of nutmeg, but it’s optional. Smooth into the 8×8 pan. Toss breadcrumbs with the 2 tsp buttery spread or spray with oil. Sprinkle breadcrumbs on top of the pan. Bake on the center rack for 30-40 minutes or until edges are bubbly and breadcrumbs are golden. 1st: you had me at cauliflower. 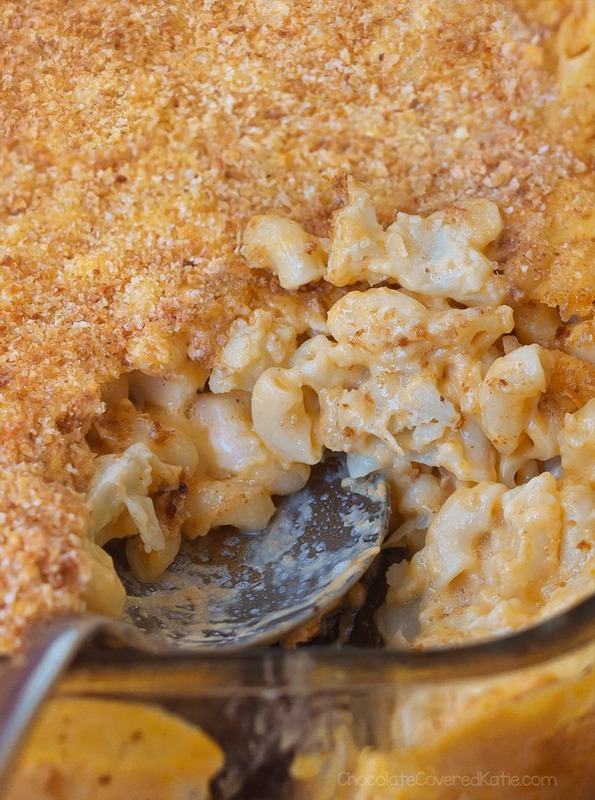 2nd: you TOTALLY had me at mac ‘n cheese! 3rd: adorable picture of you, Katie! Thank you on all three accounts, especially the last. I really (reallllly) hate posting pictures of myself online but know it’s good for brand recognition so people can put a face to the name. Hey this is totally awesome, can’t wait to try it! Also, I have a recipe request: more single serving recipes please! I love those, cause (1) I don’t have to share em (2) it’s a small portion so it’s very easy to make and perfect for anytime 😋 if you can try posting some more of those, that would be fabulous! I’ll make this on the weekend. Thank you. I have a tree in our backyard but it’ll need some trimming and cleaning before I can sit like that as I eat your creation. And don’t be hesitant to post pictures of yourself. Brand Shmand. You look fantastic, have a great smile and really complement your website. Your TV appearances, your website and emails, your book are all a testament to your abilities and your passion. Be proud of your accomplishments. You have plenty to be proud of. Oh it’s chilly outside and this is the perfect comfort food! I’ve been making cauliflower mac and cheese since the 70’s way before Kraft came up with the idea and making it vegan since 2009. It’s also great with chopped broccoli or shredded Brussel sprouts or keeping the sauce white (a mozz recipe) with chopped and seeded tomatoes (or well drained diced tomatoes). Oh, don’t forget butternut squash, pureed or chunks! delicious!!!! 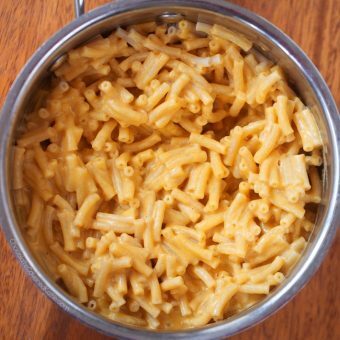 This may be a dumb question, but how much, as in cups measurement preferably, is a serving of this macaroni and cauliflower recipe? I’m counting calories, and it’s worked, and so this is important. I’m thinking a half cup or 3/4 cup per serving. Does anyone know, or are you just supposed to eyeball the pan and divide it by the servings count somehow? Hmm… The recipe says it makes 6 “servings” so if you cut it up into 6 pieces, one piece would equal one serving 😊 that’s in my opinion. Hope this helps! 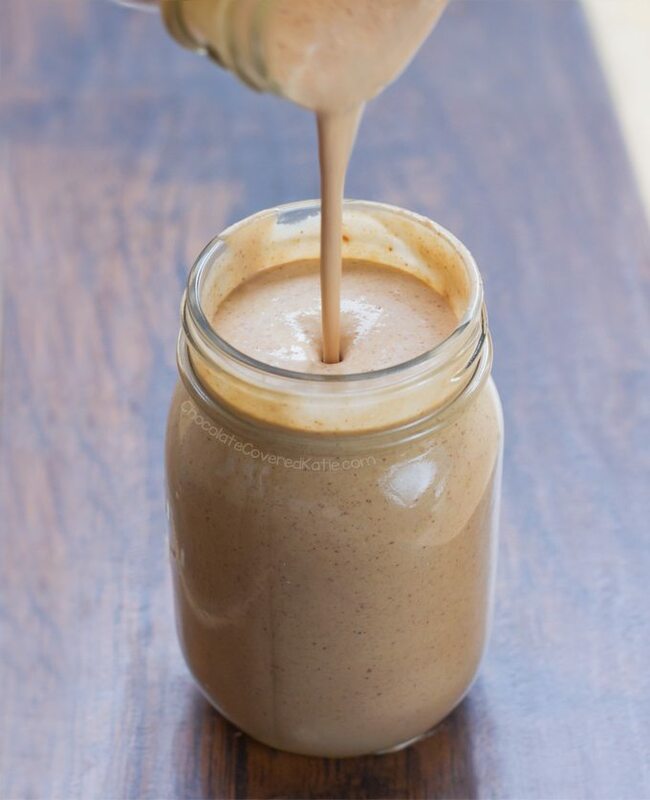 I used to use cauliflower for curry sauce and smoothies. It worked marvelously, but I am shocked I never thought of a cheese sauce! This is pure geniusness. I love the breadcrumbs on top of the mac n’ cheese! Dude this literally looks so good, I can’t believe it. I MUST make this recipe. Hi! I did the calculations, and there’s no way this is only 191 calories. Mine came out to 233 calories. That’s with 2 cups of cheese, 1 1/2 cups of skim milk, 190 calorie pasta (that’s not even 2 cup!) 2 tbsp of tapioca flour, the cauliflower and 2 tablespoons of nutritional yeast. If you have an explanation, do let me know. Still looks yummy! I’m also stumped by this. I went through twice and it is way over every nutrition amount. I don’t like when recipes are labeled “healthy” but then aren’t accurate on what makes them healthy. It gives a false hope to people who are truly watching calories or need to limits fats and sodium. Skim milk is not vegan and has more than twice the calories of almond milk. Nutrition facts will always depend on the brands and type of ingredients used in a recipe, no matter where the recipe is from, but that does not make them inaccurate or misleading. There is just no way to calculate every single possible combination of ingredients, so nutrition facts for any recipe on any website will always be an estimate. I really never leave comments on anything, good, bad or indifferent…but…BUT… I just have to say that everything that I have ever made of CCK’s has been like the best…EVAH!! I trust your recipes to be good so much that I don’t even hesitate to put the items on my grocery list. I’ve been following for some time now. Have made many recipes and loved EVERY ONE! Thank you Katie for all your hard work…and your impeccable taste buds! Love from Michigan! I can attest to that! This is why I’m trying the Mac today and will post how great it is! 😂 thanks Katie! Wow, this is really good! I love the nutmeg…who would’ve thought?? Thank you! Out of this world deliciousness, Katie! I ran out of cauliflower so I added broccoli. and that worked fine too. I made it a day earlier for guests and baked it just before dinner. The kitchen smelled amazing and heavenly..
Mac and cheese pizza sounds like the most amazing thing ever! Whenever you are playing for that very first time, it may be sensible that you choose a who you realize like your pal. Sooo yummy! I made this with almond flour and about of tablespoon of tapioca starch/flour. My Mom who’s not vegan loved it and my 1 year old did as well. I also tried your vegan Mac n cheese recipe too that was tasty. So glad I found your website I’m going to try making the vegan cheesecake next! Ooh so cool to know it works with tapioca flour. I have that in my pantry and never use it!